Window Functions – Java, SQL and jOOQ. A fun report to write is to calculate a cumulative percentage. 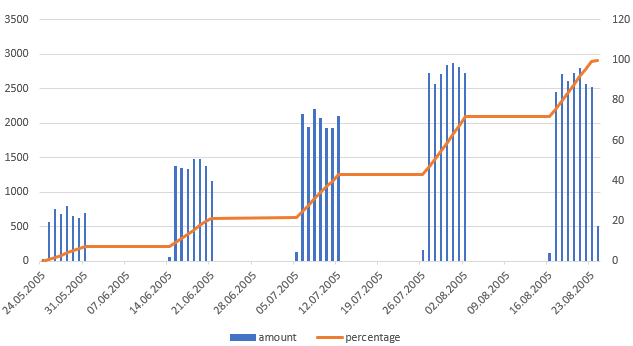 For example, when querying the Sakila database, we might want to calculate the percentage of our total revenue at any given date. In other words, at the beginning of our timeline, we’ve made 0% revenue, and then that percentage increases over time, until we reach 100% of our revenue at the end of our timeline. Because of the nature of SQL syntax, and the fact that both GROUP BY and aggregate functions “happen before” window functions, i.e. they are calculated logically before window functions, we can nest aggregate functions in window functions. Beauty is in the eye of the beholder. My eye definitely likes this sum(sum(amount)) OVER () syntax. If you cannot decipher this, don’t worry. You’re not alone. I invite you to review the following post on the order of SQL operations, first. All SQL databases support the standard aggregate functions COUNT(), SUM(), AVG(), MIN(), MAX(). But what if you want to roll your own? BiConsumer<int, Integer>: A accumulator that accumulates new values from the stream into our intermediary data structure. BinaryOperator<int>: A combiner that combines two intermediary data structures. This is used for parallel streams only. Function<int, Integer>: The finisher function that extracts the SECOND_MAX() function from the second position in our intermediary array. How to do the same thing with SQL? And what’s even better, we can use the aggregate function as a window function for free! Here, we use the STYPE (Collector.supplier()), the SFUNC (Collector.accumulator()), and the FINALFUNC (Collector.finisher()) specifications. Many other databases allow for specifying user defined aggregate functions. Look up your database manual’s details to learn more. They always work in the same way as a Java 8 Collector. SQL is a verbose language, and one of the most verbose features are window functions. How to write the query? What if my database doesn’t support the WINDOW clause? We’re going to be using PostgreSQL for this example, but it will work with any database that supports window functions, which are most databases these days. The fact that column1 is not growing monotonously means that we cannot use it / trust it as a means to calculate the length of an event. We need to calculate an additional column that has a guaranteed monotonously growing set of integers in it. The ROW_NUMBER() window function is perfect for that. Now, how to use this rn column to find the length of an event? All this does is check if b is not null and if this is true, then calculate something. Remember, b = start, so we’re putting a calculated value in the row where an event started. That was the requirement. So, what do we calculate there? A window function that finds the minimum value over a window of data. That minimum value is RN2, the next row number value where the event ends. So, what do we put in the min() function to get that value? Now, we only need to specify that OVER() clause to form a window of all rows that follow the current row. The window is ordered by rn and it starts 1 row after the current row (1 following) and ends in infinity (unbounded following). Read more about window functions on this blog. The array_agg function helps display how the sliding average came to be. For each average value, we’re looking 2 rows ahead and 2 rows behind in the ordered window. ROWS counts the exact number of rows in the frame. RANGE performs logical windowing where we don’t count the number of rows, but look for a value offset. GROUPS counts all groups of tied rows within the window. Now we can see that for each hour, we have several payments. When we order payments by hour, there are some “tied” payments within that hour (or “group”), i.e. the order among payments on 2005-05-24 22:00:00 are not ordered deterministically among themselves. The payment ids are pretty random. Now, if we look at the three window frame units again, how do they behave? I have switched from ROWS to RANGE and now the ORDER BY clause works on a number based on the epoch of the hour. What happens now? I’ve visually separated the rows by their hour and the array aggregation by the “tied” payment_ids, i.e. the payment IDs that have the same hour. In fact, this is not exactly the same result, because if we have gaps in the hours, GROUPS will simply jump over the gaps, whereas RANGE will not. As you can see, the window may now be completely empty, which results in NULL being emitted. Bonus points for the reader who can think of a real world use-case for this clause, please leave a comment! This form is really useful to edit the configuration. If we want to activate FLAG2 in RULE 1, we just go to that cell in some SQL tool like Oracle SQL Developer, and change the value. But reading the configuration is a bit different. FLAG1 through FLAG5 are not nicely normalised. How to read the data as though it were normalised? In this representation, the rules are ordered by priority, and the flags are ordered by their respective value within a rule. The flags that are not turned on (value 0) are simply omitted. This form is much easier to traverse procedurally, when “consuming” the configuration. The UNION ALL version is consistently about 2x slower on this very small data set. This is significant in the use case presented here, as a configuration table is probably read many times per day. The real world use case that is behind this blog post also needed to know when a rule started and when it ended. I.e., which flag entry was the first and which was the last of the rule. This was easy in the non-normalised representation where each rule was a single row. In the normalised version, we can use LEAD() and LAG(). LEAD() looks ahead one row to see if the rule name there is different from the rule name on the current row. LAG() looks behind one row to see if the rule name there is different from the rule name on the current row. That’s it – very simple. The window functions part of this example is part of my 10 SQL Tricks talk, which I highly recommend you watch.